Advanced Telescope Systems portable telescope piers meet the exacting requirement of a rigid base for your observing platform while being very portable, extremely solid, easily leveled and impervious to all weather. Total pier height is calculated from the ground to the top of the pier in set-up mode. Pier adapters are not included in the price. Custom pier adapters are available for an additional fee depending on the machining required. Prices do not include shipping, handling, or any applicable taxes. All prices are in U.S. Dollars. The portable telescope pier contains no parts which will rust when exposed to weather. All machined parts are constructed of high quality 6061 aluminum and powder paint treated for a durable and attractive finish. All bolts and screws are stainless steel. The telescope pier tube assembly is secured on both ends with aluminum plates to eliminate vibration effects. The primary leg attachment blocks are welded firmly to the pier tube for improved stability. Piers of 8" OD are made with 0.125 inch wall (thickness) aluminum tubing. Piers of 10" and 12" OD are made with 0.25 inch wall tubing. Piers of 8" OD can be made with 0.25 inch wall tubing for an additional $100 charge. Pier legs are constructed of square tubing and are TIG welded together for improved strength and rigidity. Fold down legs provide for easy transport to remote locations. No tools are required for set-up. Foot pads are available in aluminum or hard rubber, per customer request. Turnbuckle adjusters between the pier base and legs provide for precise leveling adjustments on uneven terrain. Telescope pier adapters are rigidly constructed to insure a solid connection in the critical junction between pier tube top and mount. Available adapters include Meade, Celestron, Losmandy, Paramount, Astro-Physics, Takahashi and other mount manufacturers. Custom adapters available. Pier adapters are not included in the pier pricing. Weight of the portable telescope pier ranges between 30 and 70 pounds depending on the pier diameter and height. All telescope piers come standard with a balanced carrying handle to facilitate easy carrying. Custom pier heights are available upon request. 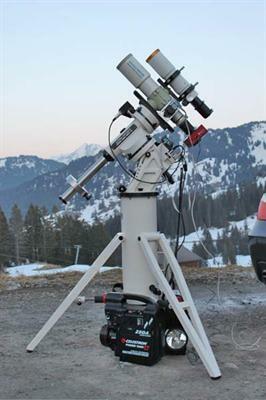 Click the button below to add the Advanced Telescope Systems 8" OD Portable Telesccope Pier to your wish list.